People today are addictively entertained by video games. Jane McGonigal says that's a good thing. 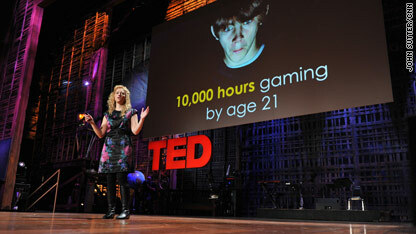 McGonigal, a game designer with the Institute for the Future, and a speaker at this year's TED Conference here in Long Beach, California, says people today spend a collective 3 billion hours per week playing online games. She wants us to play more. To solve all of the world's problems, she says, we must spend seven times that much time with games - a whopping 21 billion hours per week among us all. And, no, she's not joking. By playing online games like World of Warcraft, gamers build up "superpowers" that will help them solve real world problems, McGonigal says. "My goal for the next decade is to try to make it as easy to save the world in real life as it is to save the world in online games," she said in a presentation here. Think about that for a minute. Can searching for troll spells and conquering digital alien worlds really help us combat climate change, end poverty and reduce global conflict? Yes, McGonigal says, because in online games people tend to behave better than in the real world. In the digital space, people tend to collaborate to help each other solve problems. They don’t give up as easily. And they almost always feel they have a chance of winning. Their skills are well matched to the challenges set out before them. Such situations have developed gamers as "super-empowered, hopeful individuals," she said. She sees it as a new branch of human evolution. "Gamers are willing to work hard all the time if they're given the right work," she said. But how does this translate to change in the real world? Well, McGonigal builds social online games that straddle the virtual and real worlds. One of her projects, called World Without Oil, put gamers in a scenario where they had to come up with inventive ways to exist on a planet that had run out of fossil fuels. Players had to make changes to their real lives and then post about them online to advance in the game. Most of the 1,700 people who participated in that game have kept up with the changes they've made to their lives since the game was launched in 2007, she said. Her next project, called "Evoke: a crash course in changing the world," which debuted here at TED on Thursday and will kick off on March 3, is produced by the World Bank Institute. It pairs up mentors in the developed world with players in Africa. The goal: inspire a generation of young, African entrepreneurs to chase their dreams - by making them think they're playing a game that's fun and collaborative, and where the chance of success is realistic. "We can make any future we imagine and we can play any games we want," she said. "So I say let the world-changing games begin." Nice webpage, lots of quality content. Great post! You have shared good piece of information here. I appreciate your good work.thanks for sharing this helpful post. I be grateful for your superior work. thanks for distribution this cooperative post. English tongue isn't my main language, but I could recognize it when using the google translator. Perfect publish, keep these things coming! Give many thanks! Sewell, a native of Texas, planned on offering a menu of Mexican specialties. Most weren’t crisp, bathed in olive oil, or sprinkled with mozzarella; if cooks followed the advice offered by Good Housekeeping in 1951, their pizzas were biscuit rounds or English muffins topped with processed Cheddar cheese, chili sauce, salt, pepper, and salad oil. If this is the case, I will play my all time favorite Pool Game 24/7. Online bingo is the game of bingo played on the Internet. There are many sites poidivrng Online Bingo with different type of promotions, graphics in the site and different rooms. Unlike balls used in regular bingo halls, a random number generator is used by online bingo sites. The online bingo play works almost exactly like playing online poker or online casino games with everything being virtual. Most bingo halls also offer links to online poker and casino offerings. One notable feature of online bingo is the chat functionality. Online Bingo games give gamblers an opportunity to make use of features, which makes the game easy to gamble. Gambling bingo online gives gamblers and chance to chat with other beneficiary gamblers with whom they are challenging. Some websites propose gamblers the capability to download a free request interface through which gamblers gamble while other websites use Java or Flash enabled games which permit the gamblers to sign up and begin gambling right away without having to install anything. It's up to you whether you play for real money or play money. Fantastic post, very informative. I wonder why the opposite specialists of this sector don't understand this. You must continue your writing. I am confident, you've a great readers' base already!|What's Going down i am new to this, I stumbled upon this I have discovered It positively helpful and it has helped me out loads. I hope to give a contribution & aid other customers like its helped me. Great job. I truly agree that practices performed in virtual world bring changes in the behaviour of human in real world. Online games are best for making a person self-confident, self-motivated and self righteous! Parabéns pelo artigo sempre muito interessante.